A Filipino breakfast meal is not complete without kape, so I make sure that we always have a stock of locally produced coffee beans in the house. One of the first few organically produced local coffee beens I have ever tried is that of Kalinga Brew. This brand uses Robusta, Excelsea and Arabica coffee beans from Benguet. 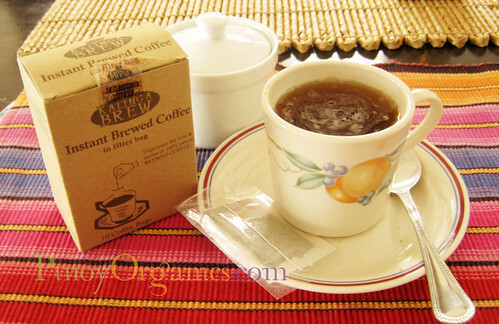 I bought my first Kalinga Brew from Manny Onalan of MOMs Organic Market in Legaspi Sunday Market in 2009. I remember liking it so much that I gave it as a Christmas gift to friends and family. Two weeks ago, I chanced upon Kalinga Brew Instant Brewed Coffee (Php100/box) in Echostore in Serendra. This variant is individually packed in filter bags and there are 10 bags in a box. 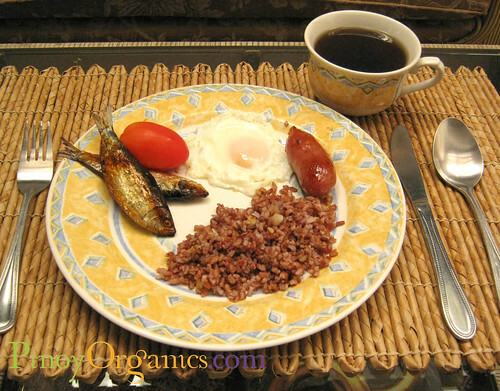 I bought a box and tried it the next day with my tinapa, sunny side up eggs and steamed organic rice. Personally, I find the original Kalinga Brew coffee beans better in taste than the individually-packed instant coffee. But, if you want to experience the taste and aroma of 100% natural brewed coffee in a minute, the Kalinga Brew Instant Brewed Coffee is good enough. You will need two to three bags to achieve the taste of real brewed coffee. Best if paired with coco sugar and/or honey. Have you tasted Kapeng Barako and Benguet Coffee already? If yes, which do you prefer? Hi, I recently tried Kalinga Civet cat coffee. It was interesting but not as special as I was hoping. Do you have any special tips on preparing it. FYI, I found it in the Kultura section of the SM Department in Cebu, not in the Kultura store in the North Wing for some reason. We usually prepare our brewed coffee manually. We use either with a french press or drip. 🙂 How about you – how do you prepare your coffee? how can i acquired kalinga coffee tree for planting?im from virginia,usa. i’ll be retiring in the philippines soon.thank you in advance. helo im interesting to have kalinga brew did u have contract no. ur email address but im plan make small restaurant. How do i order kalinga brew? Are there flavors? How much? Thanks! Kalinga Brew is a popular brand and we see it even in major local supermarkets. Check SM and Robinsons groceries. We buy ours from Manong Manny Onalan at Legaspi Market. You can contact him at +639274018905. Enjoy your mountain coffee!